A study in the September edition of the Journal of General Internal Medicine found that "discharge summaries are grossly inadequate at documenting both tests with pending results and the appropriate follow-up providers." The study found that only 13% of discharge summaries document all pending tests. And only 25% of discharge summaries mention some pending tests. Follow-up providers information was included in 67% of discharge summaries. "The documentation rate for pending tests was not associated with level of experience of the provider preparing the summary, patient’s age or race, length of hospitalization, or duration it took for results to return." The study evaluated discharge summaries at two academic medical centers for patients that had pending test results. This adds to the communication challenges referring physicians face coordinating care in follow-up to a hospital visit. Yet communications issues are accountable for over half of all preventable errors. And communications issues are twice as likely to be related to deaths as compared to "clinical inadequacy". The study reported that approximately 41% of patient are discharged with pending test results and 9% of these test results affect patient care management. 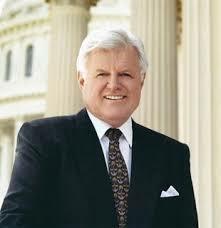 Saturday Night Live takes you behind the scenes as Republicans plan for the president's speech to the joint session of Congress. On September 3, the Certification Commission for Healthcare Information Technology (CCHIT) unveiled their plans for certification under ARRA. 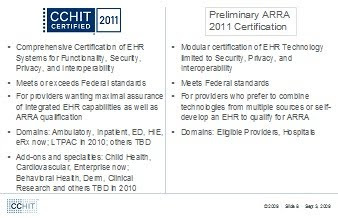 CCHIT plans two program concepts: 1) comprehensive certification which meets or exceeds federal standards and and 2) modular certification related to security, privacy and interoperability meeting federal standards. Federal standards for HHS Certification will mean that a system meets the "minimum government requirements for security, privacy, and interoperability, and that the system is able to produce the Meaningful Use results that the government expects." HHS Certification will not be a 'seal of approval' nor an indication of the relative value of systems. CCHIT's action were in response to ONC's Certification and Adoption Workgroup recommendations presented at the August 14 HIT Policy Committee meeting. Expand Certification to include a range of software sources: Open source, self-developed, etc. Unlike CCHIT today, certification criteria should be established independently of the organizations performing the certification. Multiple certification organizations will be allowed to perform testing after they become accredited. Vendors need certification from any one testing organization. Wes Rishel (Gartner) has argued that "when the choice of certifiers is made only by the vendor, not the organization that relies on the certificate, this creates an inevitable pressure to be the certifying organization that is the least thorough in its process"... "Arguably, if physicians could chose the certifying organization they would not pick the one with weakest accreditation. After all, they have to live with and use the product. But under the “any certifying organization will do” approach, this is not the option that will be presented to physicians. They will be asked to choose among products each of which is rated by several organizations, some of which are focused on the baseline requirements for certification and others of which use any number of criteria for judging products." As such, accreditation is a lynch pin in the Workgroup's recommendations to "insure that multiple certification entities use identical criteria and provide a 'level playing field' so that all certification organizations offer the same level of scrutiny." HHS Certification would also serve as qualification for the Stark exception. Providers would be allowed to achieve meaningful use through use of certified components. In one sure-to-be-controversial recommendation, the Workgroup recommended that the “lock down” requirements of EHR software should be removed to address concerns of the Open Source community. Self-developed software may also be certified, on a site by site basis. The certification transition "includes a concept of 'Preliminary HHS Certification' so that vendors, who take a risk on the content of the final regulations, can be ready as quickly as possible when final regulatory approval is obtained" which should be valid through 2011." "This certification is called “preliminary” because the meaningful use criteria and the certification criteria will not yet have completed their paths through the regulatory process. When the regulatory process is completed for Meaningful Use, presumably in early 2010, then, if necessary, establish a short “regulatory gap certification” for any necessary changes from preliminary certifications. After completing this “regulatory gap certification”, the National Coordinator should certify those products as qualifying under the statute, with a goal of having HHS Certified products in the marketplace in early 2010." "For vendors who already completed CCHIT 2008 certification, we recommend providing an optional shorter, expedited process. Request that CCHIT submit, as soon as possible, a proposal for “2008 Gap Certification,” which will apply only to vendors who already completed 2008 Certification. The 2008 Gap Certification must cover any missing privacy capabilities (e.g., audit trails, consent) required by statute It must also cover capabilities for Meaningful Use, and expanded interoperability capabilities. Once approved by ONC, the completion of 2008 Gap Certification should also qualify products for “Preliminary HHS Certification.” Those products will be required to complete the “Regulatory Gap Certification Process” before the National Coordinator similarly certifies those products. Working with CCHIT and the Policy Committee, the ONC should investigate whether similar gap certifications are appropriate for products that achieved 2007 certification." Health Wonk Review will be hosted at Healthcare Technology News on Thursday September 17. With Obama scheduled to address a joint session of Congress on Health Care Reform on September 9th, this promises to be an extraordinary edition of the Review. "Health Wonk Review is a biweekly compendium of the best of the health policy blogs. More than two dozen health policy, infrastructure, insurance, technology, and managed care bloggers participate by contributing their best recent blog postings to a roving digest, with each issue hosted at a different participant's blog. For participants, it's a way to network and share ideas, and for those readers who don't live in this space every day, it's a way to sample some of the latest thinking and the 'best of the best.'" In the meantime, you can check out the latest Health Wonk Review at the Lucidicus Project.